After spending the night in Vernon, Maple and I dropped off our car at the AT crossing on NJ-94 and were picked up by our shuttle driver. Once again, we relied upon George Lightcap, and it has been our pleasure to get acquainted with him. The morning was foggy, and the High Point monument was almost entirely shielded from view. But, despite the clouds and the chill in the air, it was going to turn into a beautiful autumn day, ideal for backpacking. Once we passed High Point Shelter, we ran into two fellow section hikers, Waldo, her dog, and friend, Chad, who were traveling in the same direction. Six miles into our hike, we stopped at a footbridge over a stream and topped off our water, just to make certain that we had enough to cook a hot lunch of ramen noodles. But, before having lunch, we decided to go a bit further. Both of us had soaking wet boots, but Maple was thoroughly drenched and, on top of that, smelling worse than a thru-hiker. So, when we stopped to cook our lunch, she changed her clothes. 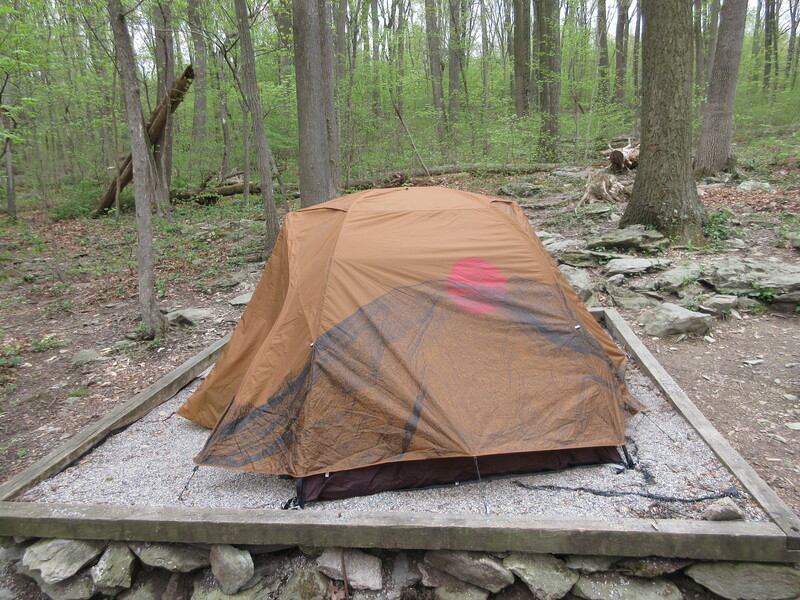 Our original plan was to stop in Unionville, NY, and set up camp in the town’s park, which has been made available for that purpose to AT hikers. However, upon arriving at Lott Rd., we decided to press on and try to get to Pochuck Mountain Shelter before nightfall. There’s a half-mile stretch where the AT runs parallel to NJ-284, and then makes a left turn to cross the road. Maple and I both missed the left turn, and consequently had to walk through a bog several inches deep. We cleared the bog and pressed on for another hundred yards or so before realizing our mistake. Not wanting to retrace our steps through the bog, we bushwacked our way through some thorny bushes until we spotted a couple of hikers and knew we had found our way back to the trail. Just across NJ-284 there is a steam. We filled our dromedary there, and I carried our water for the next six miles, including the mile-and-a-half through the Wallkill River National Wildlife Refuge. With the recent cold weather, most of the birds appear to have gone south, but Maple and I did see ducks and a crane. 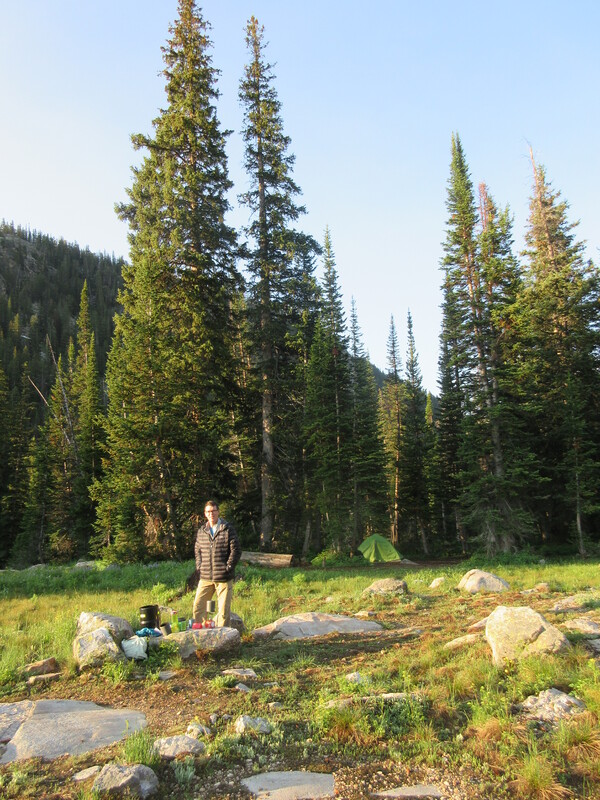 We arrived at Pochuck Mountain Shelter just before nightfall, quickly set up our tent and made ourselves coffee. And then, after sunset, cooked our dinner. By the time we visited the shelter, it was too dark to see and Waldo and Chad had already retired for the night. It was time for Maple and I to retire, as well. We were exhausted. It rained during the night, and the temperature dropped below freezing, so there was a layer of frost over everything when we awoke in the morning—twelve hours later. By 9:30 we were packed up and ready to get back on the trail. 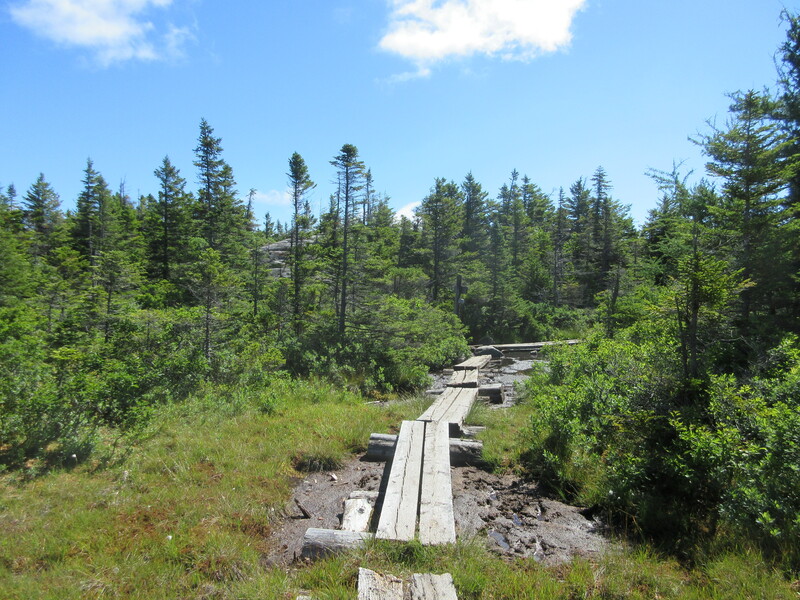 The highlight of day two was definitely passing over the Pochuck Boardwalk, a remarkable accomplishment of engineering. It follows a circuitous route through Vernon Valley and, by means of a suspension bridge, crosses over Pochuck Creek. Beyond the boardwalk are more puncheons, eventually leading us to NJ-94 and the end of our trip. 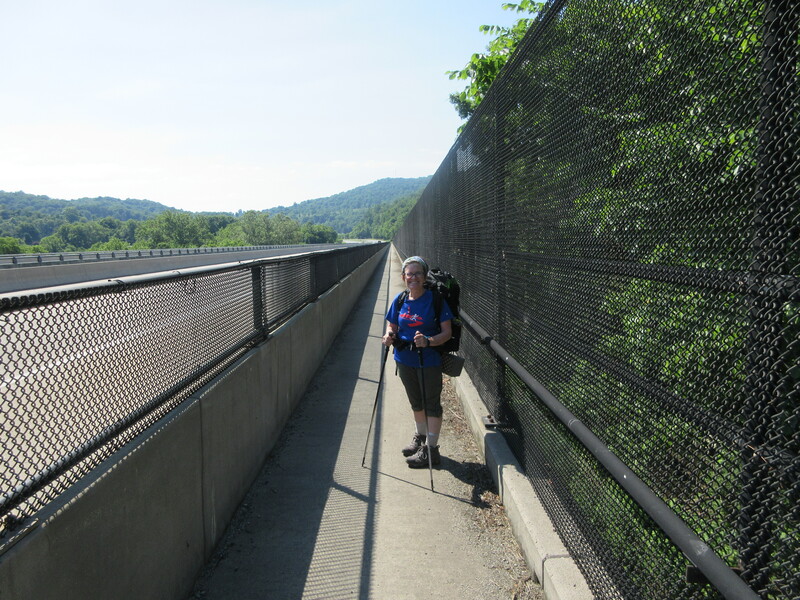 From Franconia Notch, we had to walk through the woods a ways, on the Pemi Trail, before we crossed the bridge that leads directly to the Liberty Springs Trail, part of the AT. 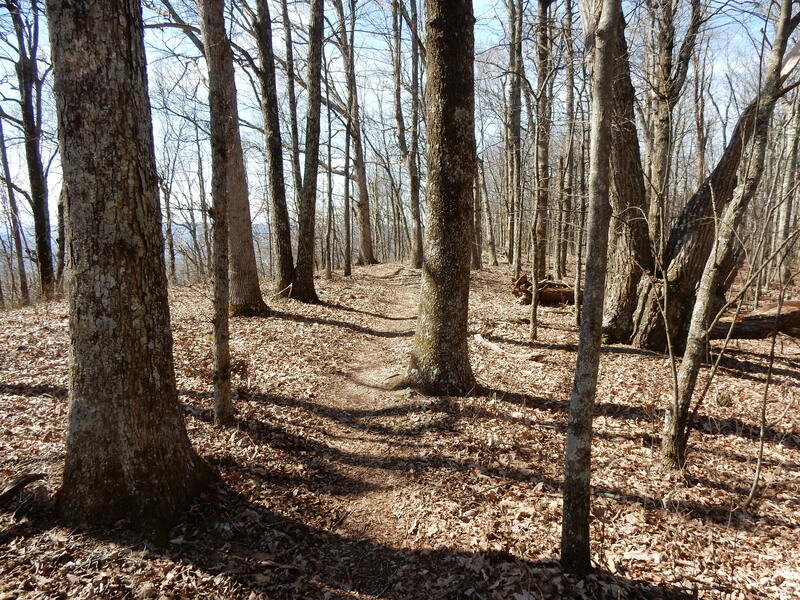 From the commencement of this trail, one has 2.6 miles uphill to the tentsite; however, the uphill doesn’t begin in earnest until one has to cross a creek. 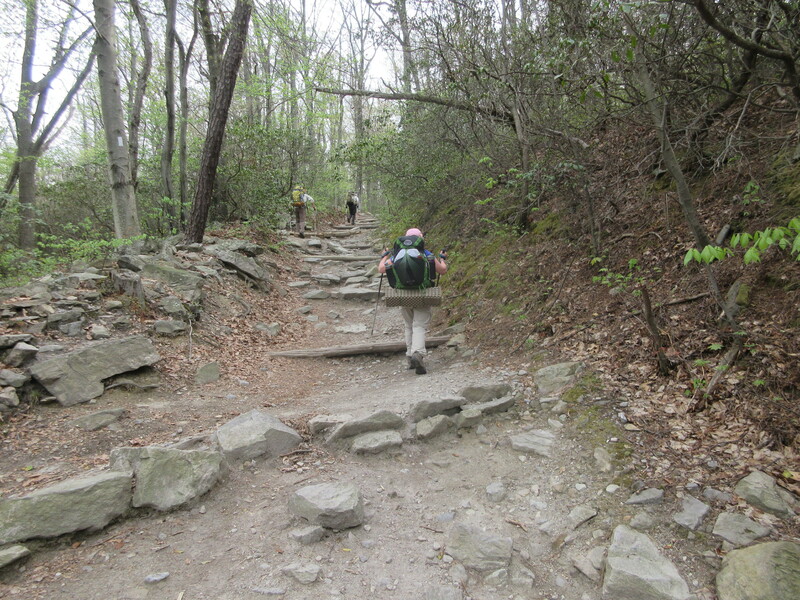 Then, one has 2 miles still to go, and it is the most strenuous 2 miles I think that I have ever experienced on the AT. Hiking southward up the Priest was definitely easier. The Liberty Springs Trail completely exhausted me. By the time we arrived at the tentsite, I was in no condition to safely backpack much further. Ryan, the caretaker at Liberty Springs Tentsite, got us situated at platform number 9—and, as I write this at 8:10 in the evening—we have the platform to ourselves. We’ve had to store our food in a bearbox and do all of our cooking—including making coffee—at the cooking area. We filtered our water at a slow-moving spring close to the cooking area. Maple and I are a bit discouraged by the hard hiking conditions and the time that it took us to make it up the mountain today. It is humid, and I was completely drenched in sweat by the time we got to the top. I think the humidity helped to drain me of energy. 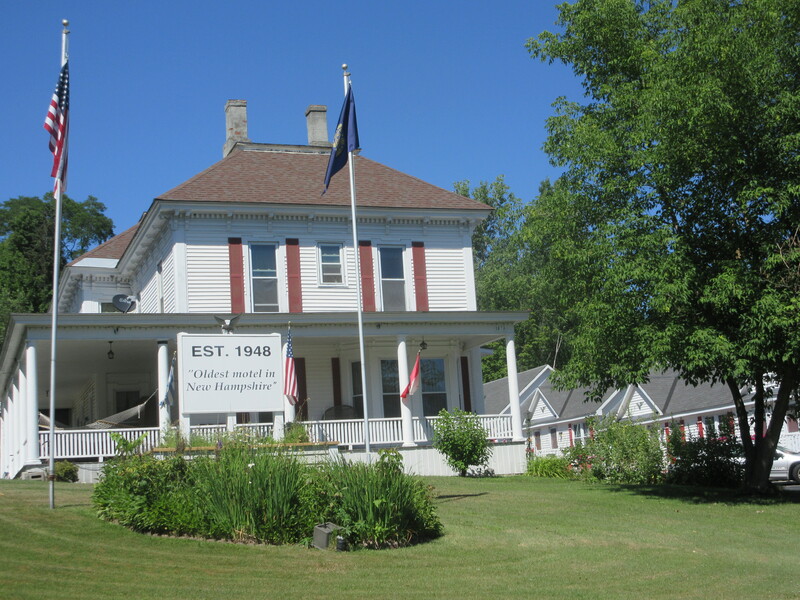 We’re committed to giving this hiking trip our best shot, and—if we can’t keep up with our itinerary, then we’ll bail out at Crawford Notch, but that would be a shame. Birch and I were up at 5:30 a.m. to begin our day. The weather was gorgeous. After eating and breaking camp, we were on the trail by 7:20. We had a serious .4 miles hike to get up to a ridge. After a good night’s sleep, the first 2 miles weren’t too bad, but I was surprised not to see the open ridge that I was expecting. Pretty soon we had a serious ascent. Franconia Ridge was spectacular but the photos make it look easy. In fact, it was exhausting. We had a ton of scrambling to do – both up and down. By the half way point I wondered if we would make it! It turned out that the 2nd half was just as difficult. This trail was kicking our patooties! Birch and I were in rough shape when we reached the shelter. The good news was that the shelter was beautiful! It was huge. Everyone who arrived seemed to stay at the shelter instead of tenting, since rain was forecast for the night and next day. There were a lot of thru-hikers there who were super nice and were also complaining about the difficult hike. It was encouraging to know that this really WAS tough. We slept well that night. Despite a forecast of incoming rain, Maple and I awoke to a still-dry morning. We decided to get moving, so we prepared our coffee and oatmeal, packed up, and got on the trail by 7:00. Unfortunately, we were both under the impression that we had to go back up .2 miles (over steep boulders) to the top of Mt. Garfield to reconnect with the AT. Forty-five minutes later, we were back at the Garfield Ridge spring and ready to move forward. Those first steps forward turned out to be down a waterfall. It’s strange what a person will become willing to do when the only alternative is an exhausting and humiliating retreat. Climbing down those wet boulders was precarious, to say the least. Shortly, after the rain began to fall, we got into our raingear. Once again, I was to learn that I get just as soaked hiking in raingear than if I were to go without it—but for some reason, I find it so hard to forego putting it on when it begins to rain. Yet, not to pack it would be irresponsible. After a difficult descent, followed by an exhausting ascent, we arrived at Galehead Hut, at about 11:30. 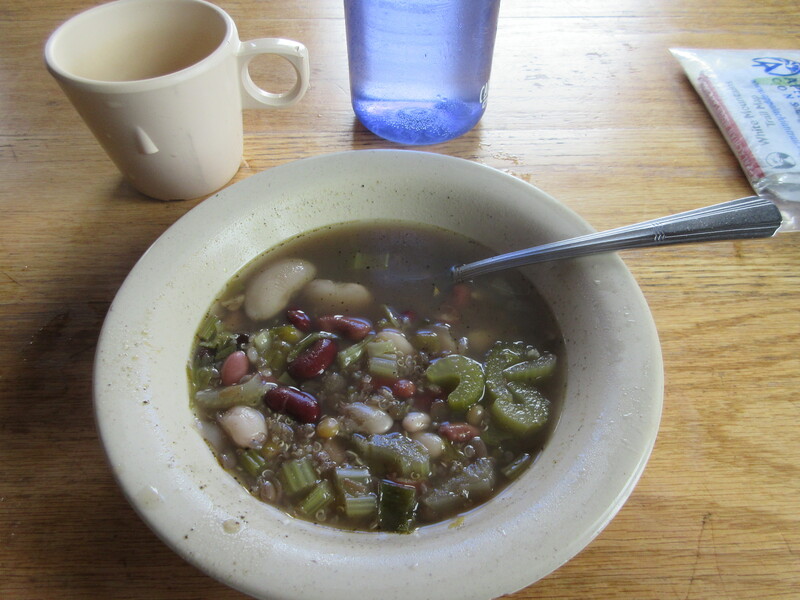 The coffee (at $1 a cup) was cold and full of grinds, but the bean soup ($2 a bowl), which became available at noon, hit the spot. We bought Snickers for desert, then ventured back out into the rain. 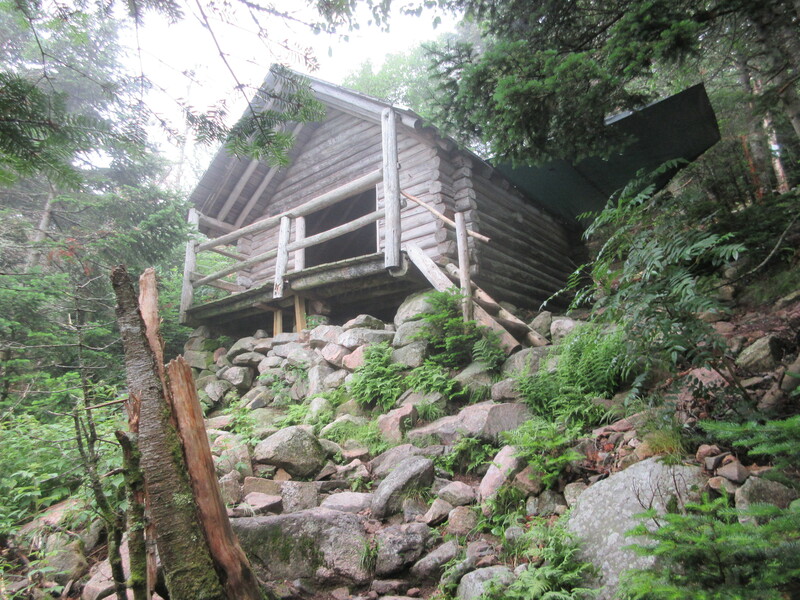 Leaving Galehead Hut, we had a hard climb up South Twin Mountain. The remainder of the way to Mt. Guyot (pronounced Gee-oh) was not as rough, but was still exhausting. Mt. Guyot is in an alpine zone, covered with huge boulders, over which one must navigate, and it was eerily half-hidden with clouds. At Mt. Guyot, we left the AT and travelled .8 miles on the Bondcliff Trail to Guyot Campsite and Shelter. Jacob, the caretaker, was happy to see us as we were, at 5:30, the first to arrive. After setting up inside the shelter, which we were to share with “Mr. Maps” (who occupied the top level), we prepared our dinner, filtered our water, and prepared to settle in for the night. We were exhausted. It was then, as I went to retrieve our journal, to write my blog entry, that I got a muscle spasm in my left knee. I could not stand on my leg, bend it, or turn it without causing myself severe pain. Maple sought help for me and returned with Niko, a fellow hiker who was trained in first-aid. He counseled me on how to tend to it and advised that we wait till morning before making any decisions based on my condition. Maple applied a freezer-bag filled with spring water, and I took 1 gram of Ibuprofen to get me through the night. Well, miracles do happen. Birch and I had planned to stay an extra day at Guyot for him to recuperate, but it turned out that it wasn’t necessary. If you had seen the utter pain he was in the night before, you would have assumed that we were in big trouble. However, we were able to hike out of Guyot and we reached the boulder-covered peak in good time. Before long, the trail descended into the trees. Although rocky, it was our smoothest day yet. 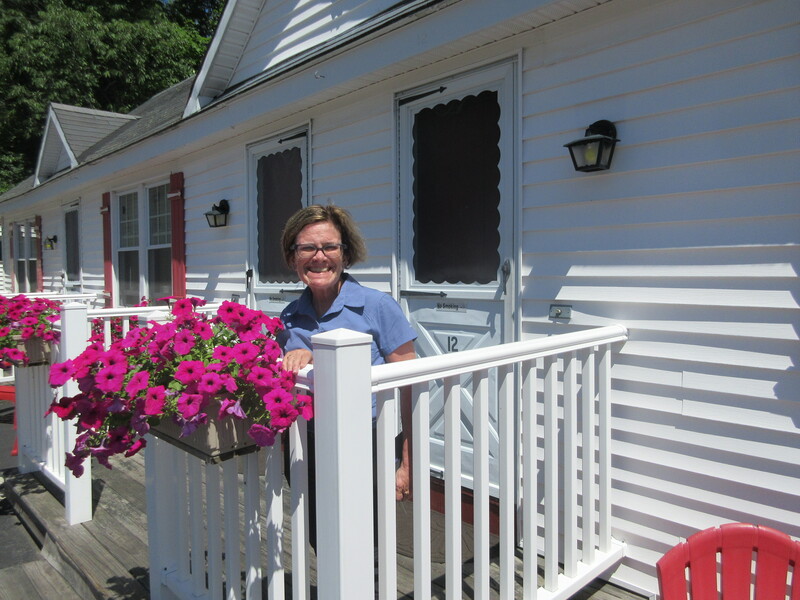 We were at Zealand Hut in no time and had a chance to relax and have an amazing bowl of lentil soup, plus a Hershey bar. There were quite a few day hikers at the hut, which offers easy access to a waterfall and great views. We saw Mr. Maps again, too, who was pleasantly surprised to see that we had made it. After an easy and short descent, the trail became amazingly flat. The only downside in this section is that we had to go through a bog or swamp for the last few miles. We walked on plank upon plank to get to Ethan Pond. Ethan “Pond” would be considered a lake in Minnesota. We set up our tent on a platform and enjoyed a long nap before having lasagna for dinner. Overall, this hike was the easiest yet, even though it was 10 miles. We were exhausted, though.The Whites are beautiful but tough! Lots of aches and pains this morning as we arose. But, after granola with peaches, we packed up and were off. There were more puncheons at first, then the trail began a slow descent down hill. This is more like the AT that Maple and I knew before we experienced the Whites. 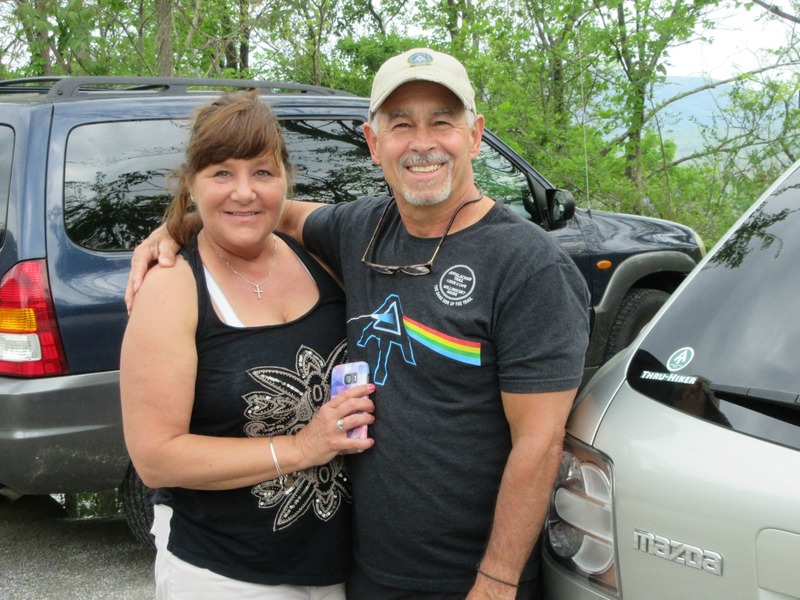 When we arrived at the parking area at Crawford Notch, the first thing I did was try my cell phone to call Garey’s Taxi Service of Littleton. I had talked to Garey in advance and had learned from him that we would have no trouble calling him from the notch, but—alas—no cell coverage, neither for us nor from any other people at the parking lot. Yet, to our good fortune, a fellow hiker that we had met at Ethan Pond offered us a lift into Littleton. Littleton is a very nice little town, with great restaurants, a hiking store (Lahouts), and the Littleton Motel, “oldest motel in New Hampshire,” where we made plans to stay for two nights. Here our trip ends. The trail has taken more of a toll on our bodies than we had anticipated. We’ll be saving the remainder of the Whites for another time. Maple and I drove six hours in the rain on Friday to get to Wytheville, Virginia. There, at a motel, we called our shuttle driver (Bubba’s Shuttles) and arranged to meet him at the Subway in Bland, to take us to our destination on VA-42, where we would drop off our car, and then to take us to our beginning point just outside of Bland, on VA-52. All went as planned, and by 10:30 Saturday morning we were on the trail. Our first day was cold and rainy. It mostly drizzled, but the drizzle will soak you, eventually, just as well as a downpour, so Maple and I wore our rain gear all the way to the shelter. I suppose the weather kept most section hikers and day hikers from the trail, for we did not see a single soul during the whole hike. The trail was, for the most part, relatively smooth, without any major uphill or downhill, so we made great time, hiking between two and two-and-a half miles an hour, and arriving at Jenkins Shelter around 5 p.m. There, we encountered L.A., (his trail name is his initials), a triple-crown long-distance hiker. 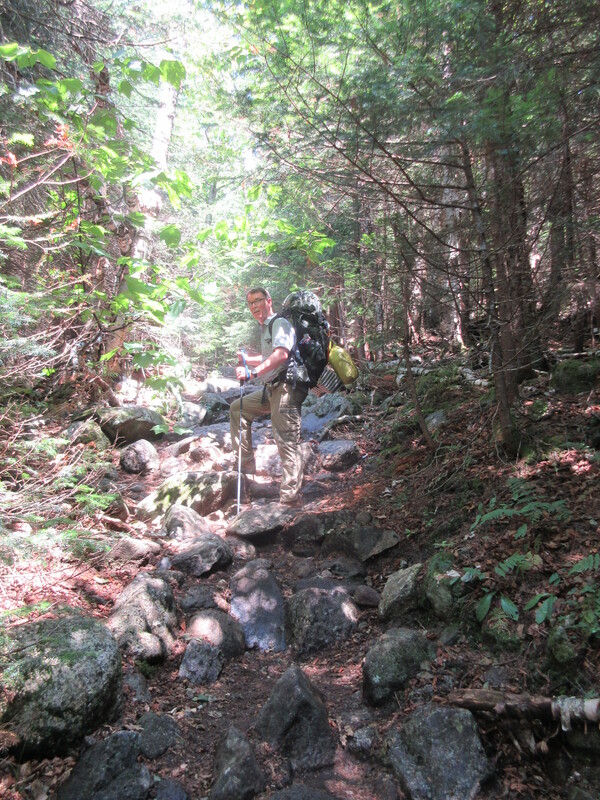 He was doing the A.T. for the second time, this time as a south-bound section hiker. 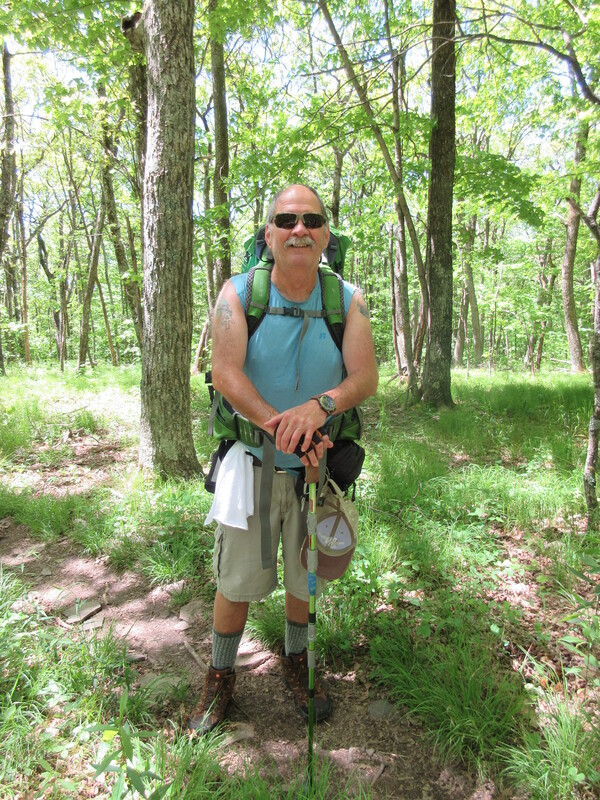 Shortly after we arrived, Atilla showed up, a north-bound section hiker who had started just 4.5 miles south of the shelter and was headed to Pearisburg. L.A. dried off and moved on, but we shared the shelter with Atilla. Throughout the night it rained off and on, but by the time we rose at 7:30 the rain had passed, leaving only a cloudy sky and cool weather. The temperature would stay within the 50s throughout the day, despite the fact that the sun sometimes made an appearance. 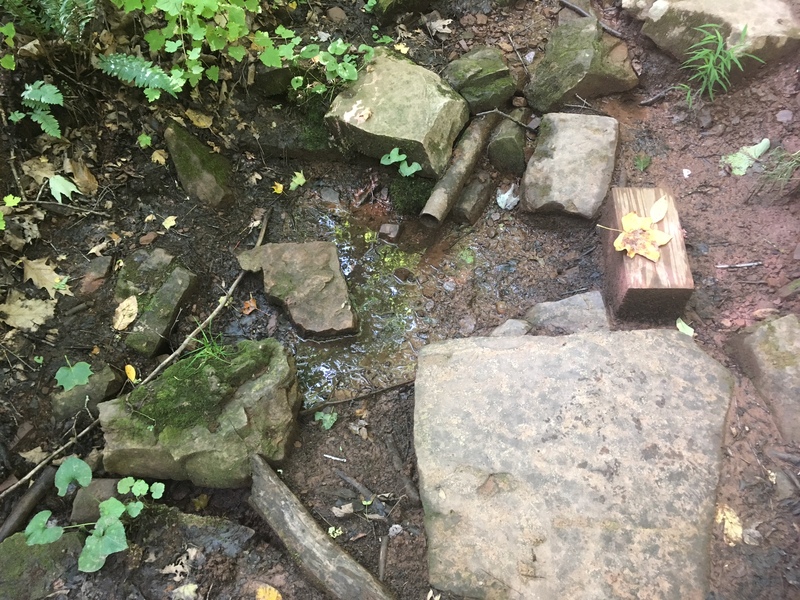 We filled up our water bottles at a creek at Jenkins Shelter and, since there was reportedly no water at Chestnut Knob, we planned to fill up our bottles and dromedary at a piped spring at Walker Gap. The A.T. was not at all the smooth path of yesterday. Today, it was a rocky path, largely uphill, and much more difficult. It slowed Maple and I down to just over one mile an hour. For the record: (1) “Davis Farm Campsite” is a field of rocks, just about the worst campsite that Maple and I have ever seen. 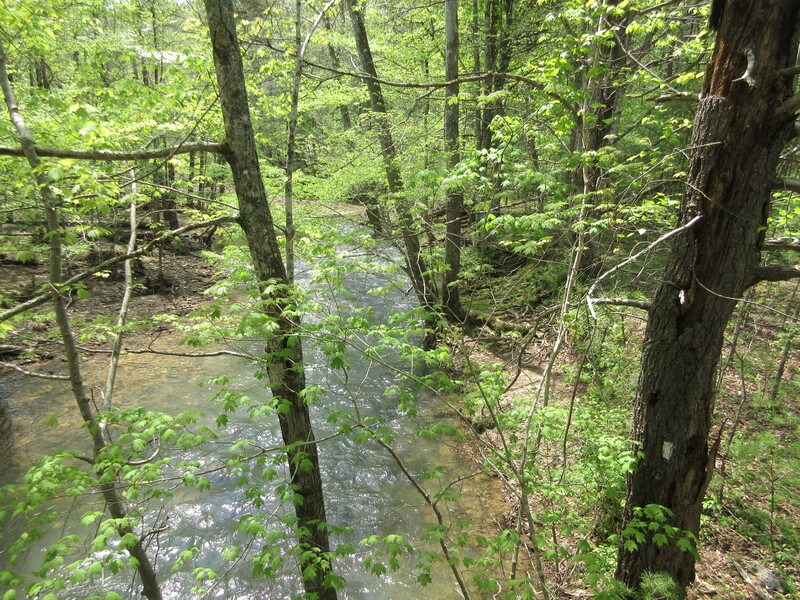 (2) Most important for us, the spring at Walker Gap was completely dry. Maple and I had about a cup of water each left in our bottles. Much dejected after reaching Walker Gap, we decided to hike beyond Chestnut Knob to what the A.T. Guide identifies as a pond, 1.8 miles beyond the shelter, with a “spring at north end, best water source for Chestnut Knob Shelter.” We were on our way when, five minutes beyond the shelter we saw a small pond that looked fairly clear. We filtered our water from this source, but the water was still brown after filtering, and the process clogged our filter. Fortunately, we were able to return to the shelter and spend the night within its stone walls. Three southbound hikers, all young men, joined us before nightfall. One had the trail name of Bruce Wayne. 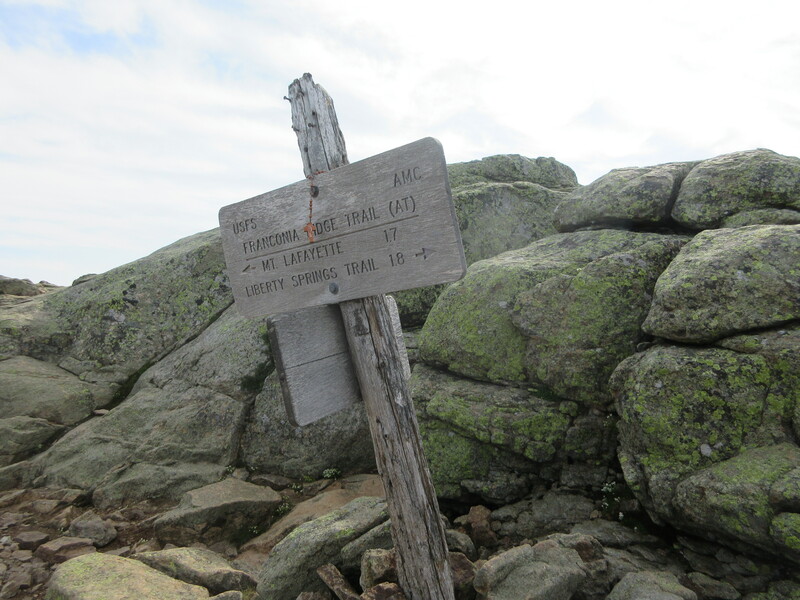 They were all hiking 20+-mile days and had begun together at Katahdin in June. In the morning, we found a hunting dog outside the door of our shelter, shivering. We let her in, gave her some cheese and water. She had a gps antenna on her, so we put her back out before we left and hoped for the best. Our travels this day were, despite the constant uphills and downhills, easier than on the previous day. The trail was, simply, not as rocky. This reminded us of how much more difficult Pennsylvania had been. We never saw the pond that the A.T. Guide listed. Our first decent water source since Jenkins Shelter was at Lick Creek. This means, essentially, that there is a 17.4 mile area that is virtually dry—unless, of course, you include the small pond of stagnant water that we had filtered from. After Lick Creek (going southbound), you go up and down a hill. At the bottom of that hill, there is a stream that appears to be constant. There was no other water source that we encountered on our way to VA-42. With our clogged water filter, Maple and I were able to get a few extra ounces of water from Lick Creek, but by the time that we arrived at Knot Maul Shelter, we knew that we had to carefully ration our supply. We were already exhausted. But with two miles to go, we were also motivated to continue. We arrived at our car before 4 p.m., and made it to Staunton, VA, where we spent the night. What a great trip it had been! Maple and I had planned to backpack the Teton Crest Trail since before we made our backcountry reservations in January, but a late June heavy snow made our plans all but impossible. Two Park Rangers in GTNP informed us that residual ice and snow made the higher passes treacherous and that hikers were turning back because they could not make out the path. The rangers suggested alternative routes. 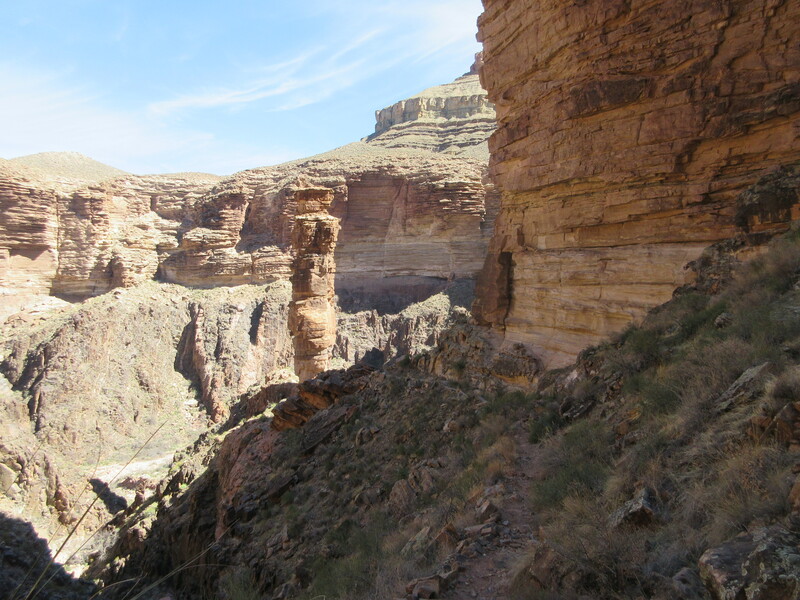 The first such route that we managed to secure was an overnight in Death Canyon. Athough terribly disappointed, at first, in our change of plans, I must admit that this hike proved to be both challenging and rewarding. Not having a 4-wheel drive vehicle, we had to park our car where the pavement ended and begin our backpacking venture a mile before the trail officially began.The trail, once begun, was uphill, and would remain uphill most of the way. 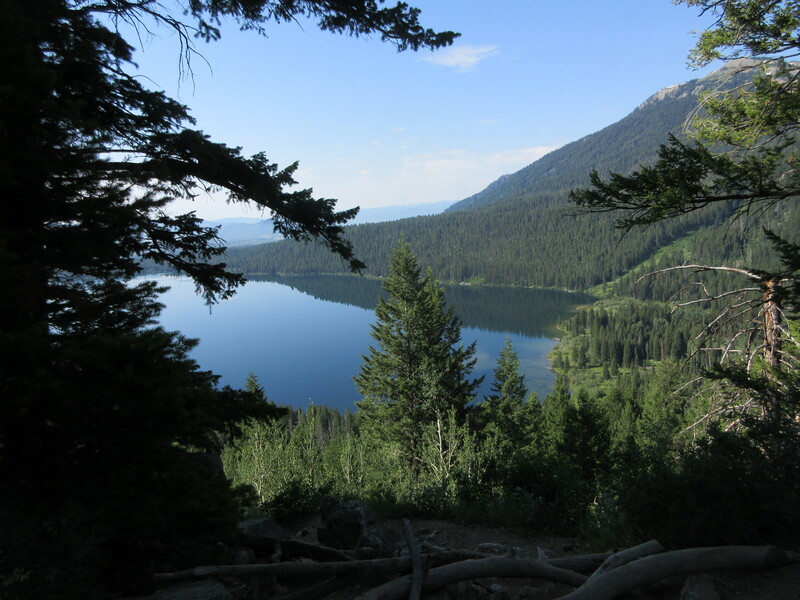 The only significant downhill was from Phelps Lake Overlook to where the Death Canyon Trail splits off from the Phelps Lake Trail. All told, we climbed 2,000 feet in elevation, despite the downhill section. 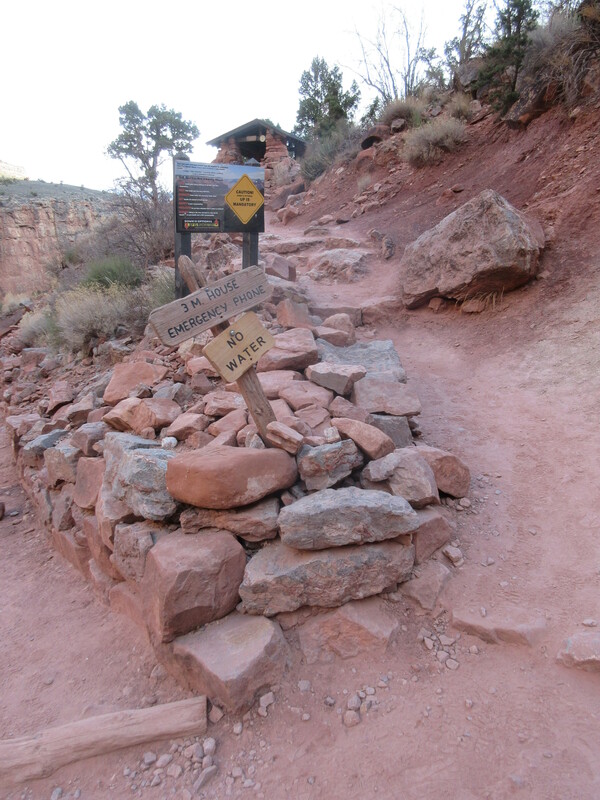 Definitely, the hardest section is the ascent up to Death Canyon itself. Once inside the canyon, the ascent becomes more moderate until one reaches Fox Creek Pass, and we made our camp under Fox Creek Pass. Maple and I crossed over water numerous times, usually on halved logs, that had their sawed, flat side facing up. Once, we had to take off our boots and socks, roll up our pants, and wade across the stream. Even the deepest water that we had to walk over was so clean that we could clearly see the bottom. Death Canyon has nothing in common with Death Valley. In July, it is green, lush, filled with foliage and wild flowers. We saw many marmots. One, after we set up camp, came quite close to us and checked out our gear. 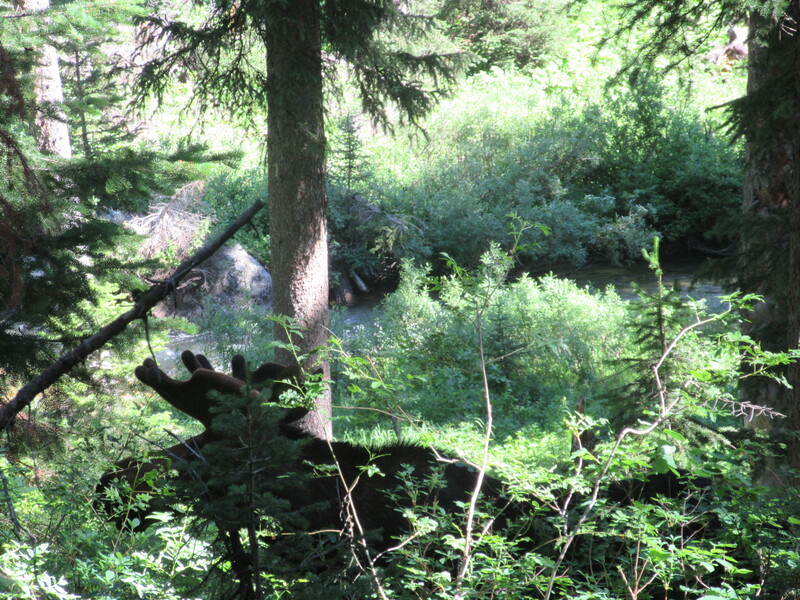 On the return trip, on the second day, we saw two moose, eating close to the trail. One surprised us as he crossed the trail 8 to 10 yards ahead of us. Before we set up our camp, in the upper reaches of Death Canyon, it began to rain. Maple and I knew that we were approaching our chosen tent site, so we kept going. We were fortunate. No sooner had we set up our tent, than our gentle rain turned into a downpour, a thunder storm and a hail storm. An hour and a half later, the sun was out again, and we laid out our gear to dry. Death Canyon was awesome. Behind our camp was a racing stream, and in front of us were wide open spaces, with clusters of pine trees and boulders, hemmed in by tall cliffs, down which poured run-off from the snow. 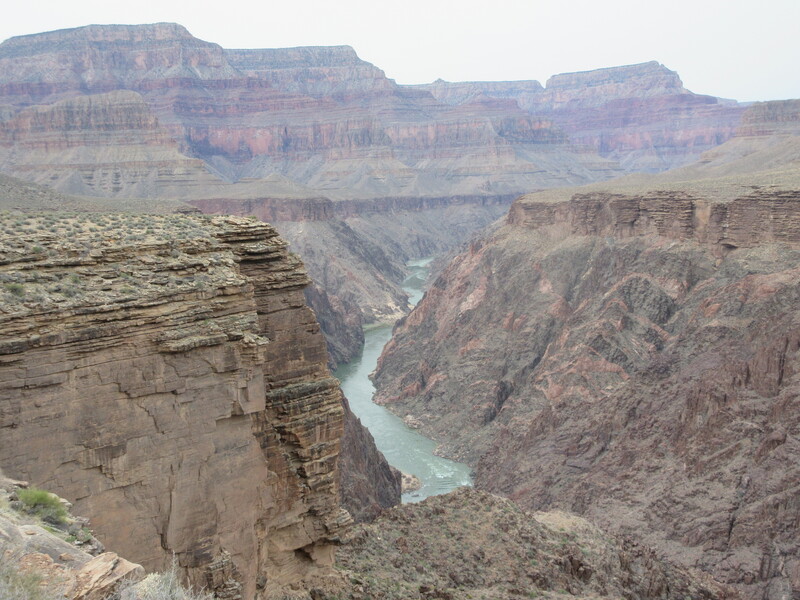 No other person was in sight, and it seemed that we had the whole canyon to ourselves. 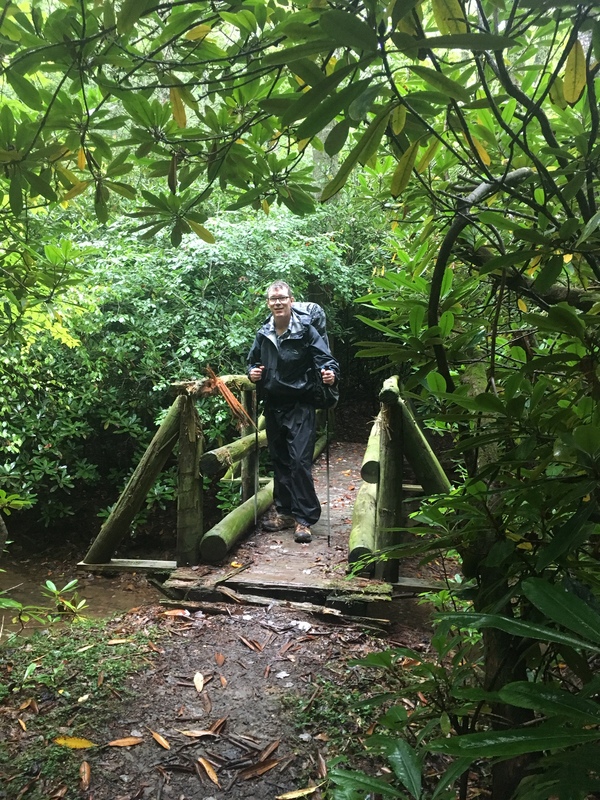 Day One: John’s Creek Valley Road (VA-632) to Pine Swamp Branch Shelter. The night before this hike, Maple and I stayed in the Motel 8 in Radford. We arranged to meet our shuttle driver, Don Raines, at 8:00 on the morning of Friday, June 2, at the AT parking spot off of VA-606. Although I saw the trail crossing, I could see no parking space. I pulled over to call Don, but we had no cell service. Upon carefully retracing the route, we spotted a little nook covered with foliage that was to serve as our parking space. Don was waiting for us. He suggested that, in the future, we meet with our shuttle driver at a place that has cell service and follow him from there. Good advice! By 9:00 we were on the trail. Rather early on we made the acquaintance of the loquacious “Man of Many Words,” who took our photo for his Facebook page. He was doing a day-hike, trying to get in shape for a thru-hike to begin in March 2018. Good luck to him! 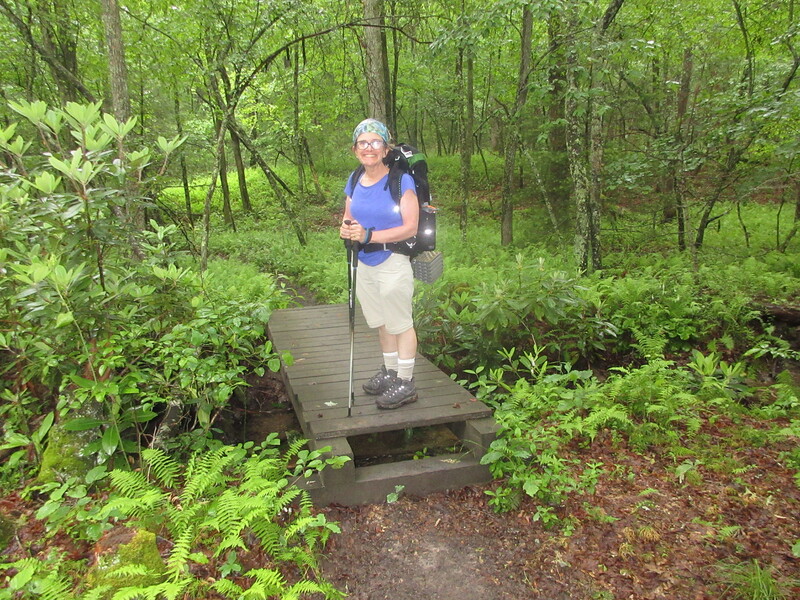 Shortly thereafter we passed a woman our age, a delightful section-hiker from Chicago, “Just Susan,” who, like us, was southbound and planning to hike to Pine Swamp Branch Shelter and, from there, to Rice Fields Shelter. We were glad to know that we would see her again. At about 12:30 we stopped to have lunch, and “Just Susan” caught up with us and passed us by. It turned out that we stopped too soon, for shortly afterwards we reached Wind Rock. There we met “Barefoot,” who told us that his ex would have put a stop to his hiking, so he is thru-hiking with his divorce papers, I suppose to remind himself of his liberation. We also met “Furiosa,” who also took our photo. After nine miles, we stopped at Baileys Gap Shelter, refilled our water supply, had conversation with the other hikers stopping there, and made coffee. Rejuvenated, we pressed onward, crossed over Stoney Creek, and continued onward. We had heard from “Roub” that we should stop at the “Captain’s” place to enjoy his renowned hospitality, but, unfortunately, the zip-line to the Captain’s place was shut down due to the fact that he had recently undergone mouth-cancer surgery. 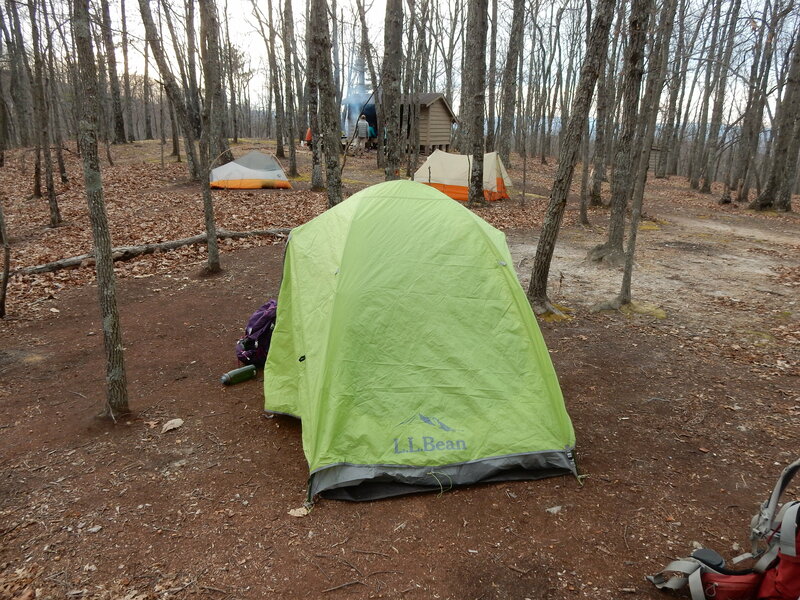 We pressed on and, in the growing darkness, after ten hours of hiking, found our tent spot just across the trail from Pine Swamp Branch Shelter. At the shelter’s picnic table, where we always like to make our dinner, we met thru-hikers Dave, his adult son, Darren, and veterinarian student “Golden,” with her dog ironically named “Killer.” “Just Susan” never showed up, and we wondered where she had stopped and whether we would see her again. Day Two started with a steep hike up to Pine Swamp Ridge and Peters Mountain. Birch and I followed a rocky ridge that had beautiful views and a nice breeze. This area is right on the Virginia-West Virginia state line. It is the season of mountain laurel blooming, one of my favorite plants! One really fascinating aspect of the ridge is that there were many HUGE table rocks. Before long we entered a meadow that was once an apple orchard. The direct sun was quite a shock after time in the woods. After entering the woods again we finally came to a spring that was 1.5 miles from Rice Field Shelter. This was our last water source before the shelter so we filled up and had coffee while there. Springs are like any water hole. It attracts a ton of hikers! One thru hiker told us that he was desperately trying to get out of the “bubble” and away from some specific hikers. I can just imagine how unpleasant it would be to be stuck with the wrong crowd. 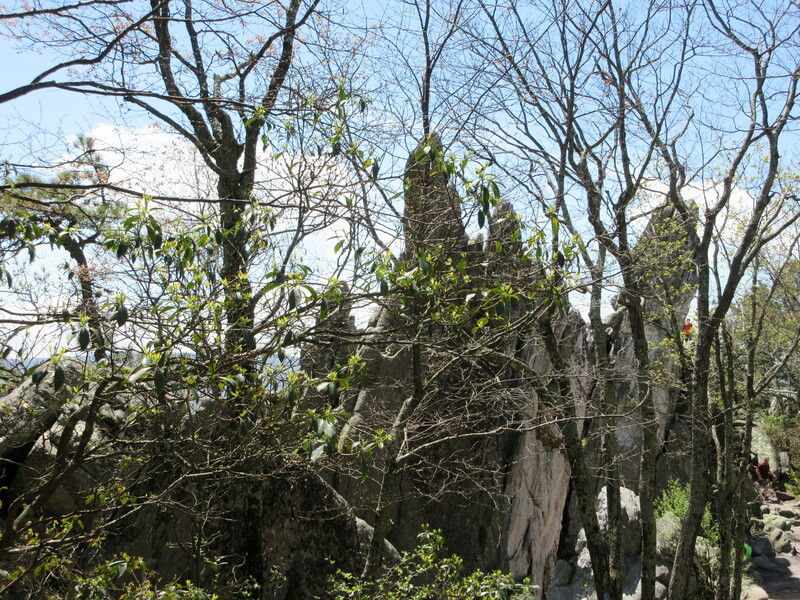 Once we approached Rice Shelter we were amazed by the breath-taking view. Wow! This is a shelter worth visiting. We set up our tent, made dinner, and enjoyed the beautiful vista. We knew that “Just Susan” was hoping to get to the shelter but we were not holding up much hope to see her, given the 16-mile trek. However, she made it! Day Three: Rice Fields Shelter to Doc’s Knob Shelter. 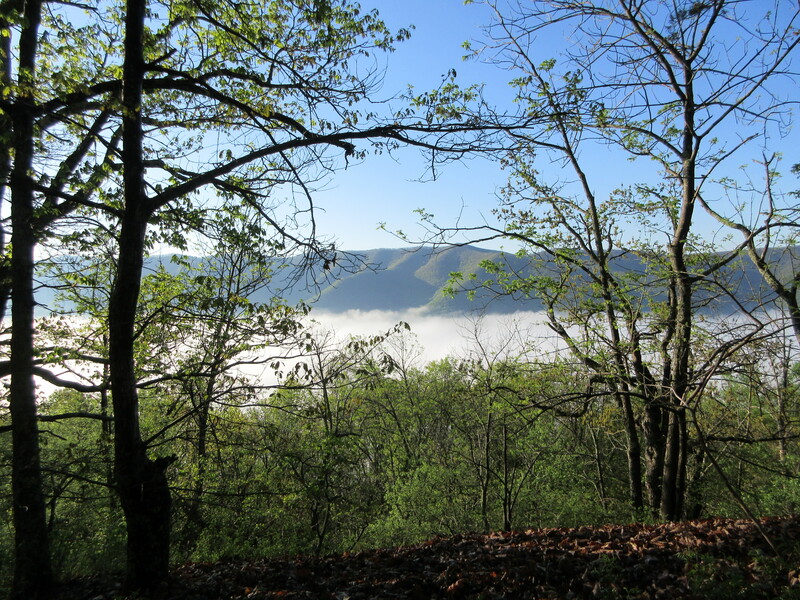 Our itinerary had called for us to make it only so far as the spring and campground on Pearis Mountain, a quarter of a mile south of Angel’s Rest, at the peak of Pearis Mountain. But if we decided to stay there, that would necessitate another 13.5 mile trek on the following day, Monday, and since the forecast for Sunday night and Monday was continual rain, Maple and I decided that we would re-evaluate, upon reaching the spring, whether we could press forward and, perhaps, commit to making it to the next shelter and water source. 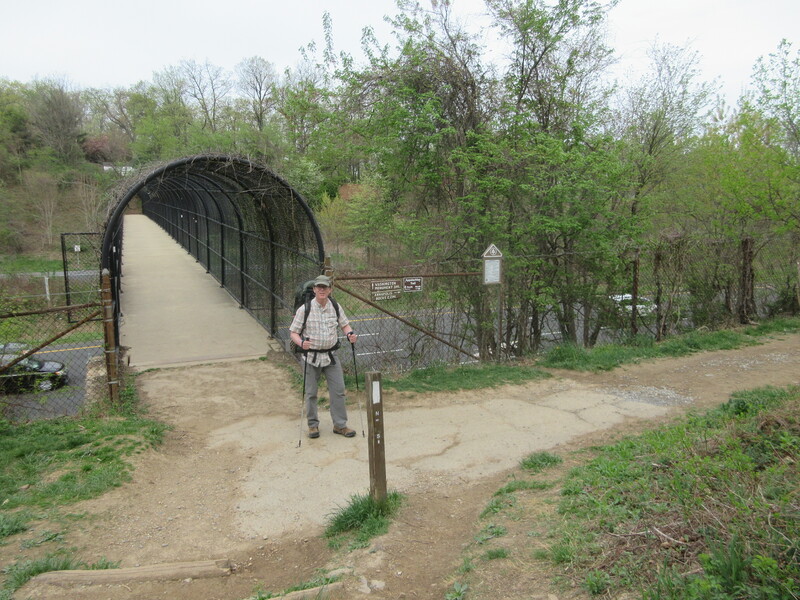 The downhill trek, off of Peter’s Mountain, to the bridge over the New River on the outskirts of Pearisburg took us longer than we had expected. We paused and enjoyed a snack after crossing the bridge, near Pearisburg Cemetery. From this point on, we were a little confused about our path, for the AT had been relocated since our Data Book had been printed. For example, we never arrived at Layne Street, Pearisburg, but instead, almost immediately began our ascent up Pearis Mountain. This two-mile ascent up Pearis Mountain exhausted all of our energy. 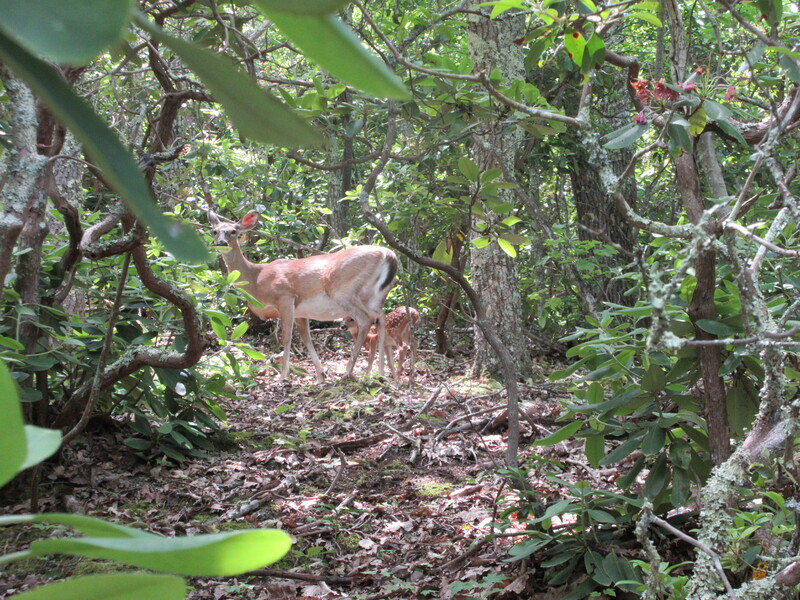 Near the top, in a grove of rhododendrons, we spotted a doe with her newborn fawn. We passed by Angel’s Rest and soon reached the sign directing us a quarter of a mile off the trail to a spring and campsite. As our water was depleted, we followed the sign, and at the spring filtered our water and made a hot lunch. This helped to restore us, but the trail had taken its toll. We were tired. Even so, as we didn’t want to carry extra water, we committed to making it to the next water source and shelter, Doc’s Knob. This would be a 16.1 mile day—the farthest that we had ever backpacked in a day. We passed by at least a dozen thru-hiking NOBOs, all intent on making it into Pearisburg to escape the rain. Were we foolish, hiking into the coming storm? Perhaps, but Maple and I were on a tight schedule, and we had already committed ourselves to the trail, despite the weather. 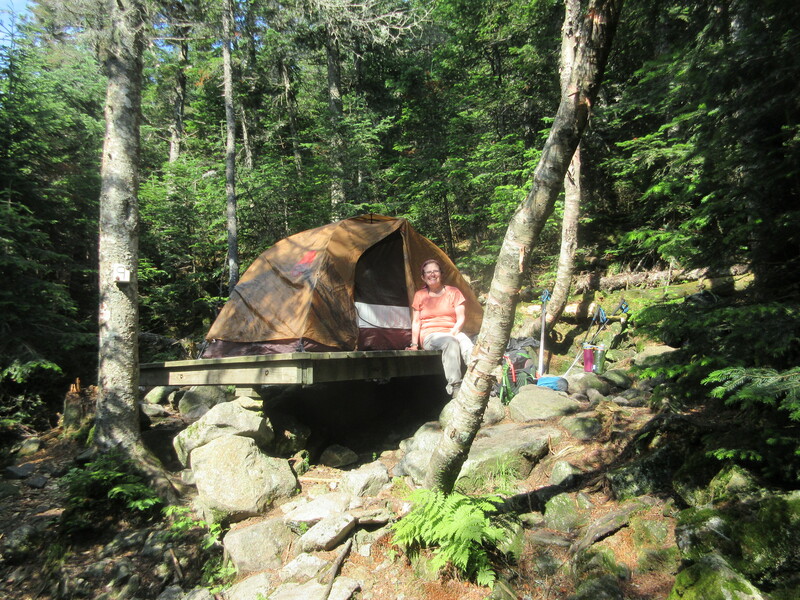 When we finally arrived at Doc’s Knob we found the shelter occupied by a very pleasant man, “Loon Seeker,” and his dog. As there was no place to set up a tent, and as we expected rain, we requested a place in the shelter, and he gladly made room for us. Afterwards, there showed up “Tent Pole,” named for having broken one, and “Loner,” who wasn’t too happy about sharing a shelter with a dog. Given his attitude, we figured he wasn’t too happy about sharing a shelter with anyone. Doc’s Knob was situated in a very wet and muddy area. Fortunately, there were plenty of rocks around the shelter to step on. This was the first time that Maple and I shared a shelter, but we had little choice, and since we were so exhausted, we fell asleep early and slept soundly. 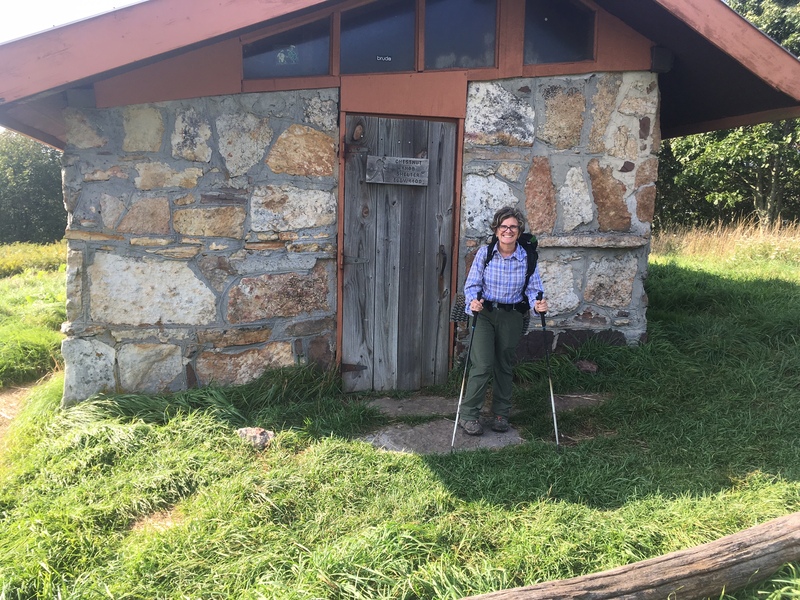 Day Four: Doc’s Knob Shelter to Wapiti Shelter. Overnight, it seemed we had dodged a bullet. The rain never came. Then, around 6:30 am, we began to hear the pitter patter of rain on the shelter roof. Birch suggested that we take off to avoid a swampy trail. As we were about to leave, who should come to the shelter but “Just Susan”. She had decided to slack pack going north from Woods Hole to Pearisburg. She was full of energy and that energized us. 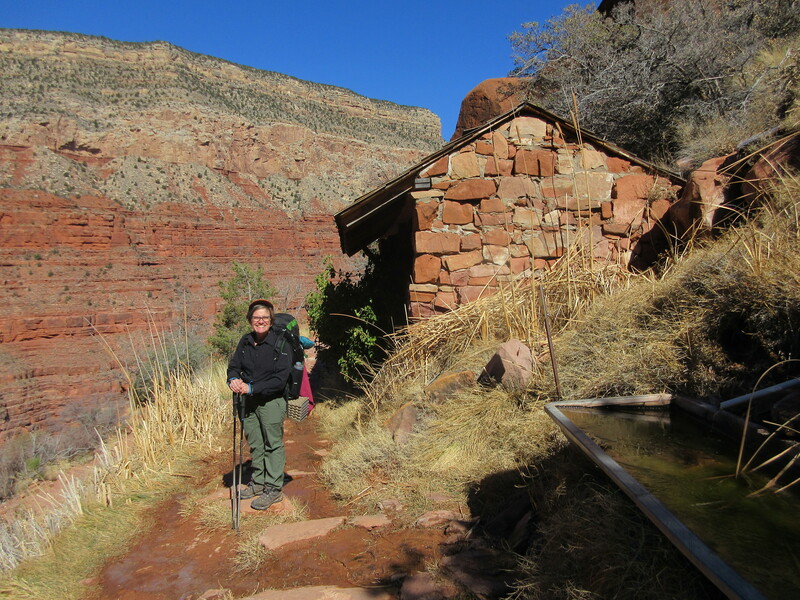 We wished her well and began our short 9 mile hike to Wapiti Shelter. At first, I was quite pleased. Despite the rain, I was pretty dry. 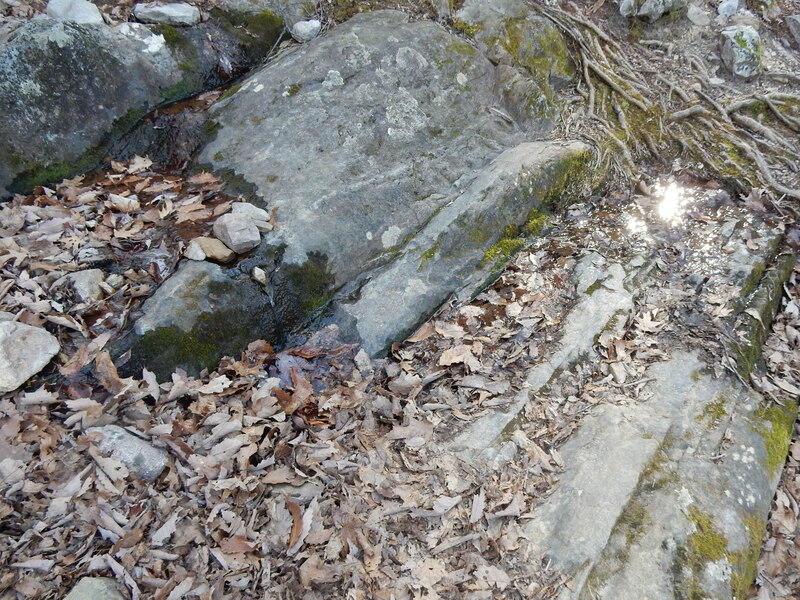 Much of the terrain was rocky and slippery. This made it slow going. By the time we passed Big Horse Gap and got to the sharp descent to the shelter it began to pour…a deluge! The trail turned into a river and all hope of staying dry was lost. By the time we reached Wapiti Shelter it was surrounded by a moat. Two hikers had just finished up lunch and were continuing on their way. All afternoon, hikers came in to get out of the rain. Each one took off their boots and rung out their socks. We met many wonderful folks, including “Radar” and her dad who were on a south-bound 5-day section hike, like us. Many hikers came in to have a bite to eat. It wasn’t long before the shelter smelled like a combination of smelly wet socks and Mountain House lasagna! One of the best parts of the afternoon was spending time with “Red Bull”. “Red Bull” was dressed in a kilt with patriotic socks and a flag bandana. He had a serious speaker system that played music for us while we waited for the rain to stop. Despite playing “Hear Comes the Sun”, it didn’t work. We had fun anyway. By 6 pm the rain stopped. 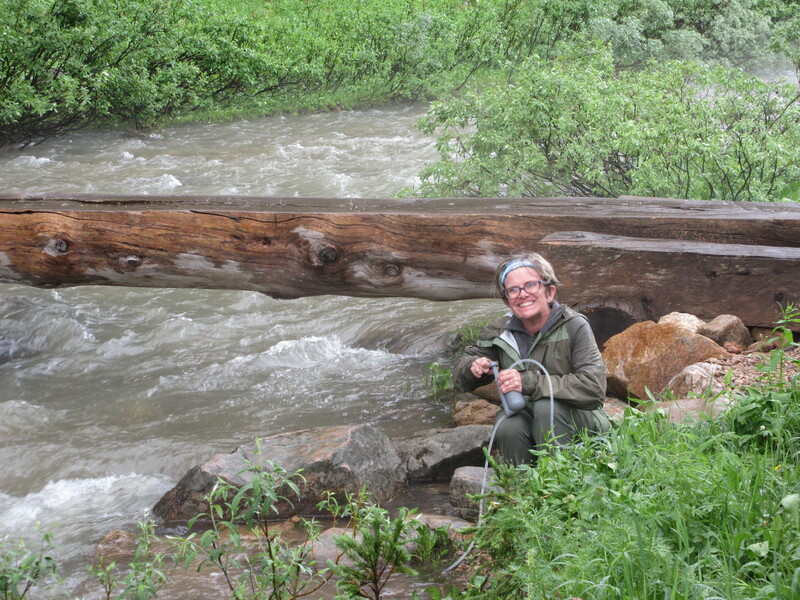 We were joined by “Loon”, a women from Minnesota who hiked 24 miles in the rain. “Down Hill”, “White Sands” and “Paint Brush” joined us. “One Pole” was also at the shelter. 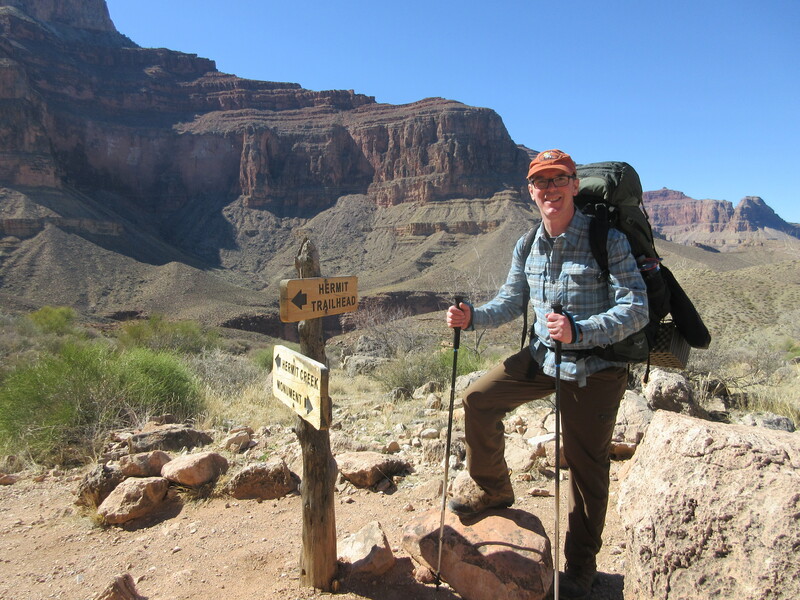 He had broken a trekking pole on one of his first days on the trail and we couldn’t quite imagine how one could do that! It was a fun group. Day Five: Wapiti Shelter to VA-606. In the morning, Maple and I packed up our wet tent, prepared an oatmeal breakfast, to which we added dehydrated peaches, and said goodbye to “Downhill,” “White Sands,” “One Pole”, and “Paintbrush.” Our backpacks were still wet, and despite the threat of continued rain, we decided not to put on our wet rain gear. How can I describe how wet and muddy the area was through which we hiked? Between Wapiti Shelter and VA-606 there were sixteen bridges, fourteen of which were within 2.5 miles south of Wapiti. 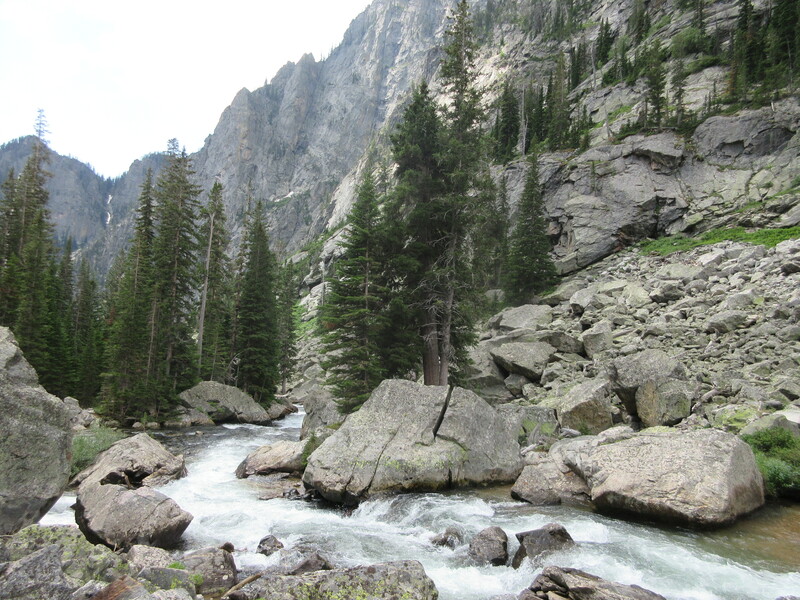 There were also several small creeks, which we crossed over by the help of rocks and logs. The mud was pervasive, and there was no avoiding it, however hard to tried. We decided not to go to Dismal Creek Falls, since we had heard that the Blue Trail leading to it got one only so far as the rear of the falls, and that one had to cross the deep and swift creek over a log in order to arrive at the front of the falls. Maple and I are not great risk takers, and we were anxious about the condition of our car and about getting home. So, we passed up the Blue Trail. What we had accomplished on this trip was noteworthy: We had hiked several consecutive days more miles than we were accustomed to. We had hiked a 16.1 mile day, by several miles the farthest that we had ever backpacked. 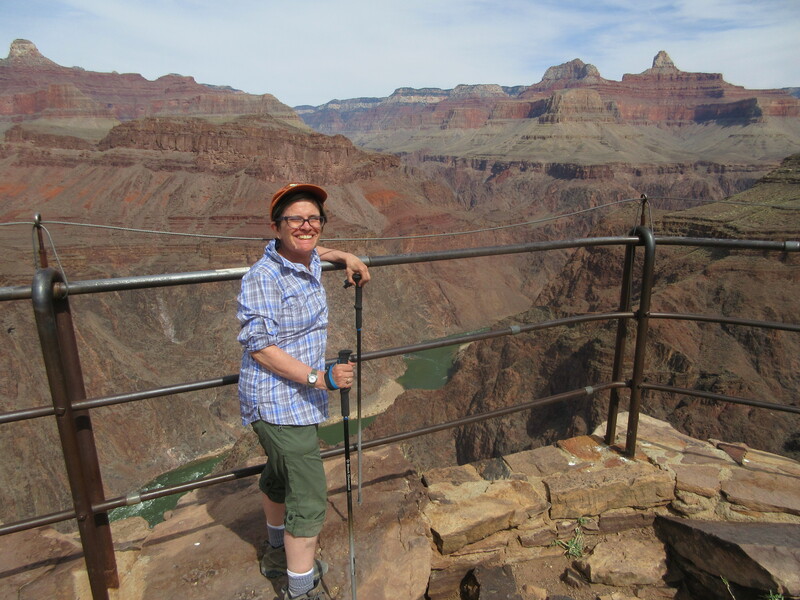 And, we had hiked five consecutive days, which we had done only once before—in the Grand Canyon. Moreover, we had hiked nine miles in the pouring rain and had learned what it means to hike when thoroughly soaked. This was a great trip for Maple and I, and has given us confidence for our upcoming hike in Grand Teton National Park, next month. 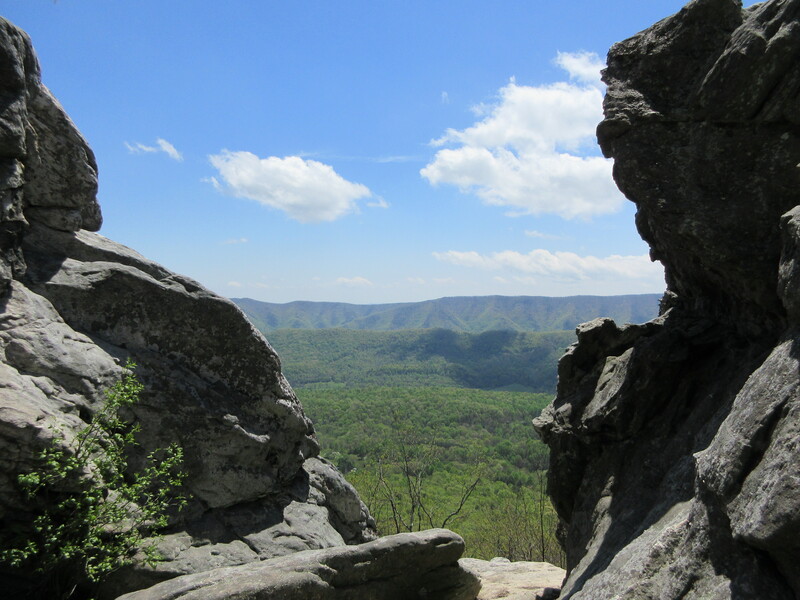 VA-311 to Pickle Branch Shelter is a strenuous 12.5 miles, particularly since it involves climbing Cove Mountain and Dragon’s Tooth. Maple and I decided to make the stretch a little easier by dividing it into two days, starting our hike on the same day that we drove out to our destination. When we arrived at the parking lot on Craig Creek Road after 2 p.m., our shuttle driver, “Roub”—whose acquaintance we had made at Bryant Ridge Shelter—and his wife “Mama Roub,” were already there, waiting for us. They had very graciously offered to shuttle us, and they were wonderful company. On our way to our starting point on VA-311, they pointed out a popular dining spot among AT hikers, the Homeplace Restaurant, on Catawba Valley Dr. We hoped to go there after our hike—but, alas, it does not open until later in the afternoon. We’ll have to try again. We knew that it was going to rain, but Maple and I had hoped to make it four miles before camping. That didn’t happen. After two miles, it began to sprinkle, and we found a great tent spot on the ridge. As it turned out, the rain did not begin in earnest for another hour, but by that time we had had coffee, had eaten our dinner, and were comfortable inside our tent. In the morning, we awoke to find ourselves above the clouds. The sky had cleared, and it was promising to be a beautiful, though hot, day. We postponed breakfast and got back on the trail by 7:30. 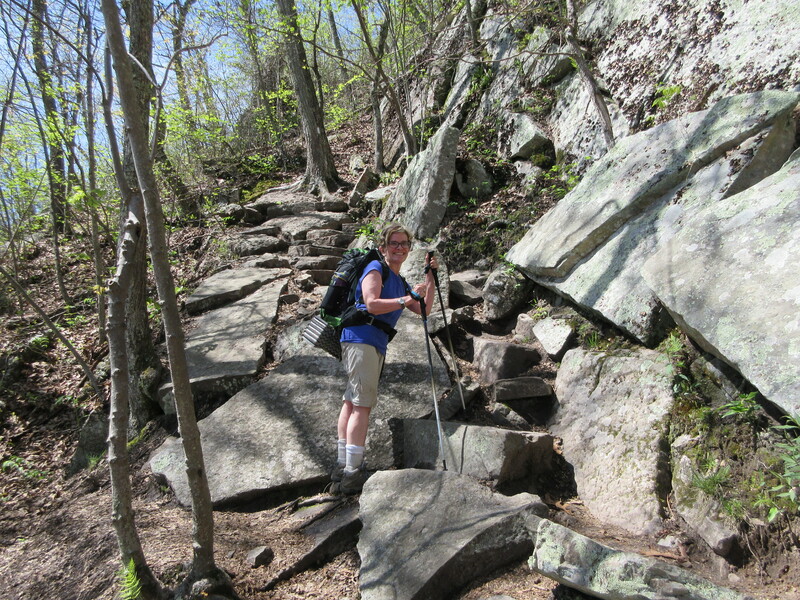 Once we got off the ridge, in Catawba Valley, we found the trail muddy and slippery. 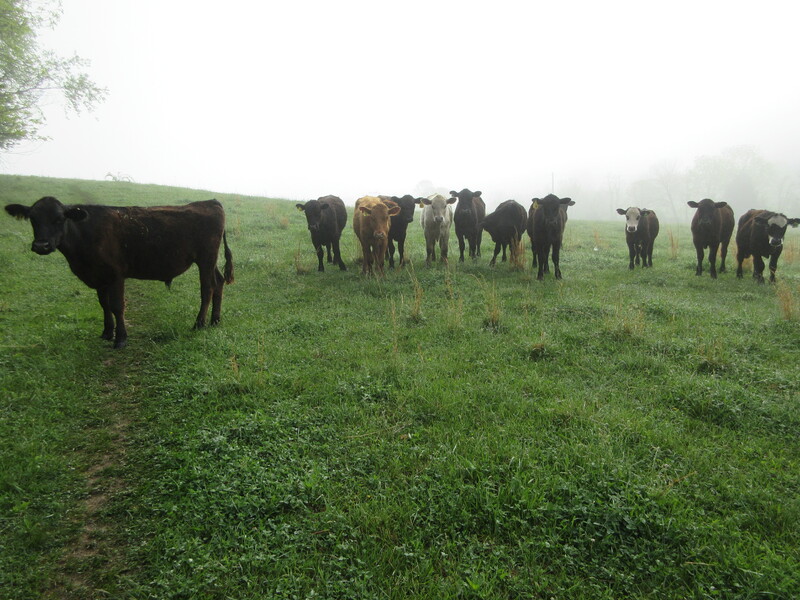 At one point, a gathering of steers approached us and threatened to block our path. 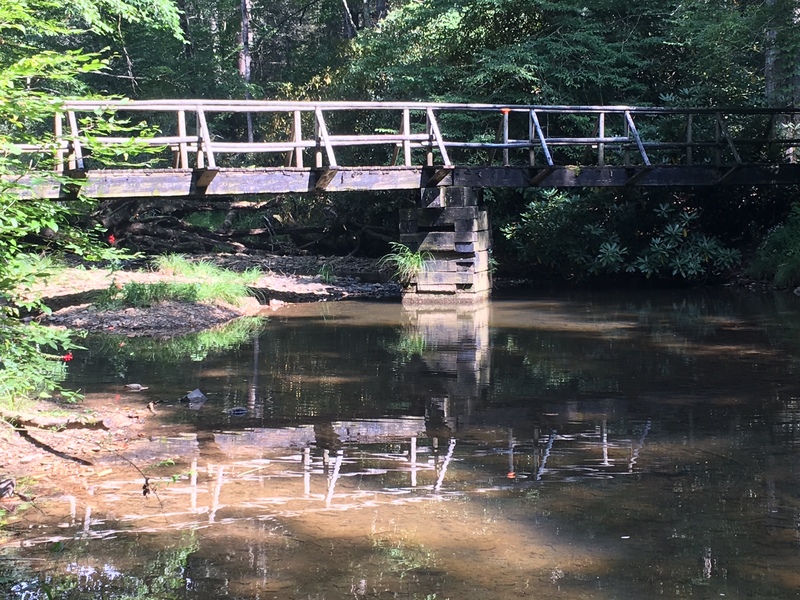 When we arrived at Catawba Creek, we found that the recent rains had made it deep. As there was no bridge, Maple and I had to remove our boots and roll up our pants before crossing. Once across, we rested at a tent spot and had our breakfast. 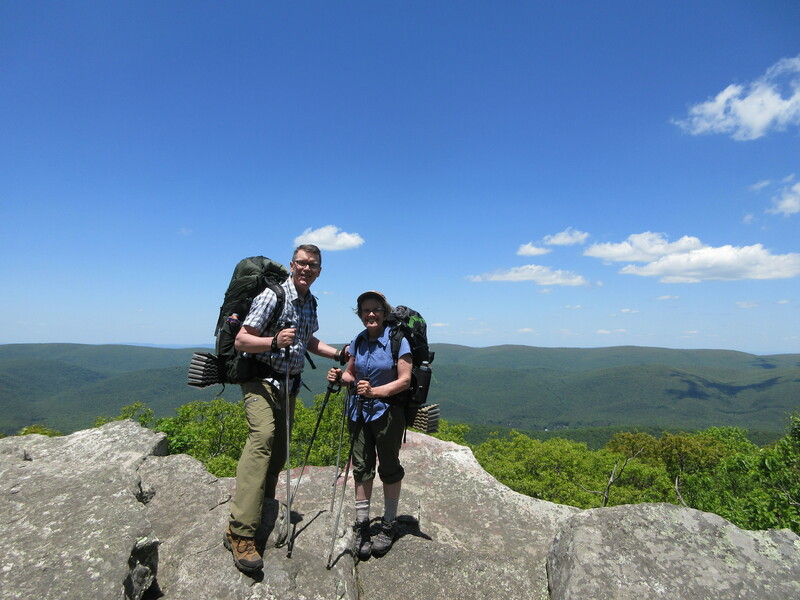 The combination of heat and physical exertion left us exhausted, and though we stopped for lunch shortly after leaving Dragon’s Tooth, Maple and I still found ourselves plodding along for the last 4.2 miles of our day’s journey. We stopped, probably, every twenty minutes, but eventually found ourselves going downhill toward the shelter. And, once at the shelter, a short but steep descent brought us to the plentiful and cold water of Pickles Branch. There we refilled and cooled off before setting up our tent. Sharing the shelter with us was a small and pleasantly sociable group of students from Spring Arbor University, in Michigan, led by their teacher, the university’s Library Director, Robbie Bolton. They were enjoying the end-of-semester culmination of a one-credit course called Backpacking and Wilderness Experience. Like us, they were southbound, but there was a second group from SAU that was northbound and that we would cross paths with on the next day. Our third day out promised to be another hot one, in the upper 80s. Having had to ration our water the day before, I decided to carry about 1.5 liters extra. We had a four-mile uphill stretch to get to the top of Brush Mountain, where there is a monument to WWII hero Audie Murphie. 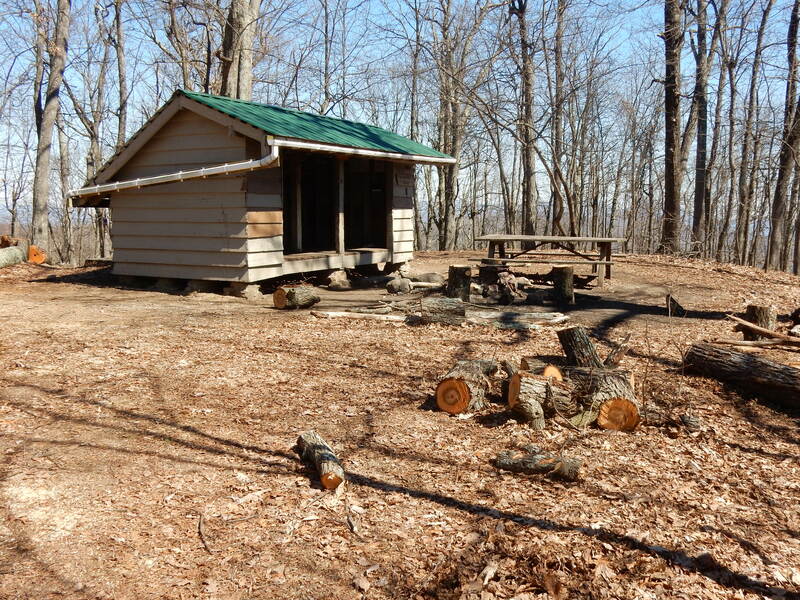 Surprisingly, there are also two park benches, probably built by the Roanoke ATC. After three miles downhill, we finally crossed the swift and deep currents of Craig Creek and made it back to our car. What a rewarding adventure! 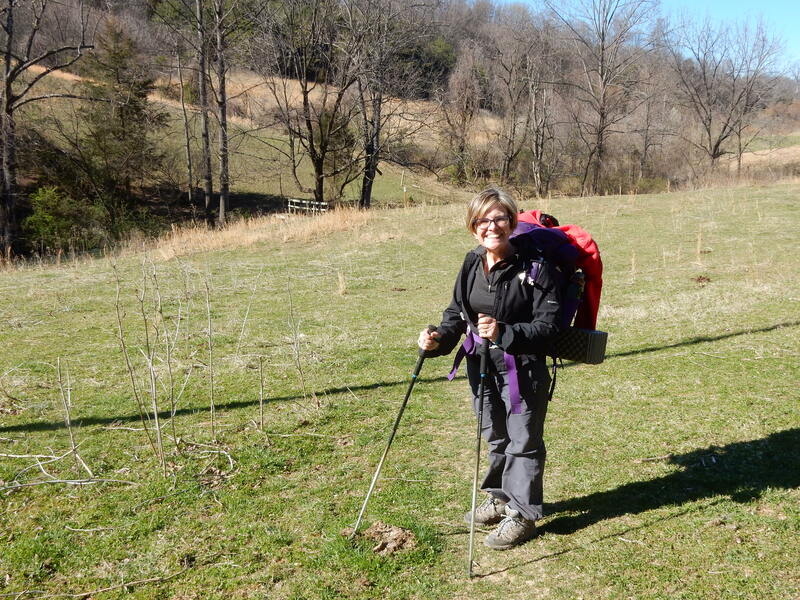 This past weekend Maple and I continued our southward journey on the AT in Virginia, hiking 20.1 miles, beginning at VA-43, east of Buchanan, and ending in the town of Troutville. Once again, we relied upon a shuttle service provided by Homer Witcher, who is the supervisor of all the shelters under the care of the Roanoke A.T.C. He dropped us off at our beginning point at 10 a.m. on a beautiful, but cold, Saturday morning. The temperature reached up into the 40s in the late afternoon, but with the constant wind, it rarely seemed much above freezing. A beautiful day for hiking, if dressed appropriately. And we were. We crossed the Blue Ridge Parkway several times on Saturday, and the trail stayed fairly close to it always, until we reached Taylor Mountain Overlook. Here, after having our lunch, we crossed the parkway one last time, westward, and then parted ways with it. From here it was another 2.8 miles to Wilson Creek Shelter, where we were to spend the night. We knew that Wilson Creek, an abundant water source, was a half mile south of the shelter, and since we weren’t looking forward to adding a mile to our hike (back and forth from the shelter), we took advantage of what appeared to be a small spring that crossed the trail about a quarter mile north of our destination. We filled our dromedary, continued our hike, and arrived at Wilson Creek Shelter before 4 p.m. Seven young people had arrived before us. Among them were four north-bound thru-hikers, the first that we have come across this year: Hot Rod, Alpine, Sub-Zero, and his partner, Golightly. 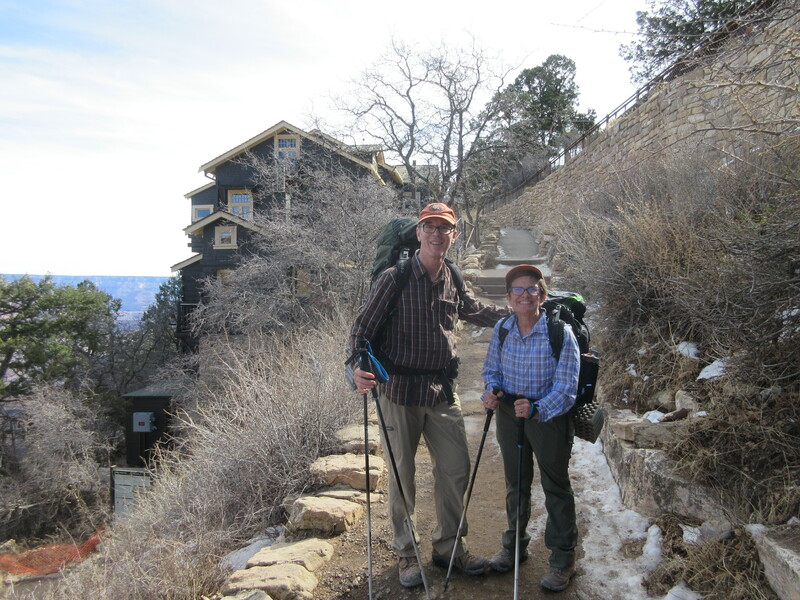 They had begun their journey in January and were presently accompanied by several college friends on spring break from Illinois–friends who were getting a taste of the backpacking life. At dusk, Maple accepted their invitation to make smores. They were all quite friendly, and it was a real pleasure to get acquainted with them. My only real concern is for Alpine, who has made it a habit to hike at night using his headlamp. Already he has had several falls, and I fear that it is only a matter of time before he injures himself. Maple and I retired with the sun, played a game of backgammon, and then slept well, bundled up in our long underwear and sleeping bags with liners. When the Sunday morning sun woke us up, we made our breakfast of oatmeal and coffee on the picnic table in front of the shelter. When we packed up, we forgot our sporks on the table. It was an oversight we wouldn’t discover until we stopped for lunch at Fullhardt Knob Shelter. Eating Lipton’s Cup-a-Soup noodles with our fingers reminded us of our dinner along the “Roller Coaster” in northern Virginia, when I had forgotten to pack our sporks, and we had to manage macaroni and cheese with our fingers. Fullhardt Knob Shelter has a cistern from which we were able to filter water. 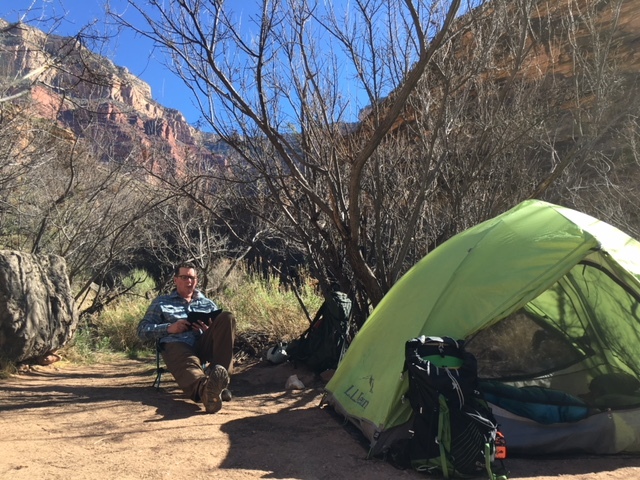 We had planned to spend Sunday night here, but we had made good time, despite the thousand-foot elevation gain between Curry Creek and Fullhardt Knob. And, since we didn’t have sporks with which to eat dinner and breakfast, we decided to hike the remaining 3.8 miles to our parked car on US-11. Interestingly, after descending from the shelter, we had to pass through some privately owned land, including a cow pasture and a grass covered hillside, which is very steep and not represented on the AT map.